Burners volunteering to be costumed archers will have an especially dramatic role to play in the Trojan Horse production. They will march in the Grand Procession Friday night when the horse is transported to its final destination for the burn and then be posted around the horse within the safety perimeter. Aided by fire nymphs who light their arrows, and integrated with the choreography of the pageant, archers will initiate the lighting of the horse. We are recruiting experienced archers, especially females (garbed as Amazon Warriors or attendants to Artemis). Archers will provide their own recurve or long bow and make or purchase their own arrows modified to the specifications developed for this project. Training and performance will be supervised by Richard “Ozzie” Oswitt. Ozzie is an engineer, a career Coast Guard officer, and an avid outdoorsman. Most importantly, he is an accomplished archer who has loved the sport since he took it up in high school. He is also one of the few people in the world who has actually shot flaming arrows in combat (he lit up fire zones from his patrol boat in the Mekong Delta during the Viet Nam War). Volunteers should complete the Casting Call form specifying their interest in archery, and Ozzie will be in touch directly. We’re looking to build a company of good archers who can serve Apollo and Artemis, the god and goddess of archery, with Olympian standards! 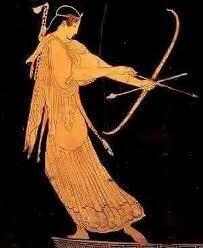 And the Amazons, of course, were legendary for their skills with the bow. Together we will have a starring role in the pageantry surrounding the horse. 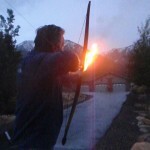 We must have archery skills as well as Burner enthusiasm—both are essential for the safety of pageant participants and spectators and for the creation of a stunning visual display. We will meet to rehearse on Wednesday and/or Thursday to prepare for our performance on Friday. I have chosen traditional archery equipment—the recurve or long bow. 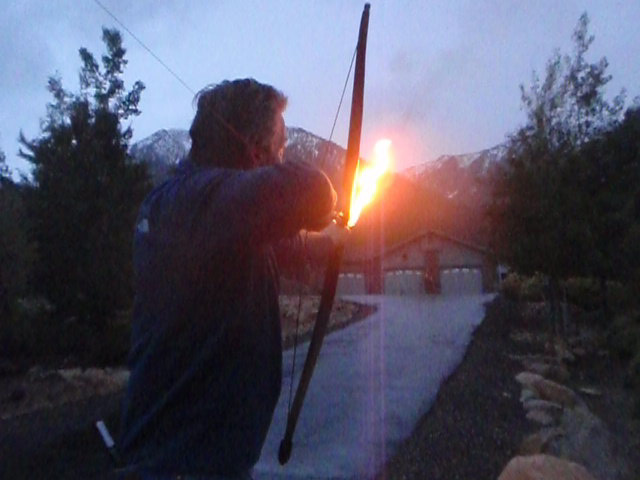 With safety in mind, we will use tethered arrows with flaming tip modifications. I suspect that igniting a 50’ wooden horse with flaming arrows in front of a roaring crowd of Burners will be the most exciting thing many of us will ever do with a bow. It’s sure going to be fun, and then we get box seats for the rest of the show. That’s a bull’s eye as far as I’m concerned. 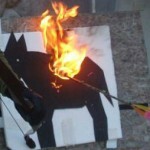 Visit Ozzie’s great personal Trojan Horse Archer’s Site for updates, pictures, videos and a list of fellow archers!